Cur-OST EQ Immune & Repair uses patented Immune Assist® mushroom beta-glucans with vital amino acid blend to enhance and promote a healthy immune response and support tissue repair in horses. Benefits allergies, gastrointestinal health, tendon and muscular injury healing! Cur-OST EQ Immune & Repair Uses Patented Immune Assist Micron mushroom polysaccharide blend with targeted amino acids to restore a healthy immune response, improving lymphocyte and NK cell activity. Aids in tissue repair & recovery. Benefits tendons, muscle and intestinal health. Excellent for added support in tendon recovery, EPM and Lyme support! Persistent or recurring infections or illness? Increased susceptibility to infections due to stress or competition? Recurring tendon problems or other injuries that fail to heal? Recurring problems associated with EPM or Lyme’s Disease? Recurrent allergies associated with a weak immune response? Recurrent eye or respiratory conditions? FACT: Many equine health conditions are associated with a dysfunctional immune system including allergies and infectious diseases. Performance horses are more predisposed to these conditions due to ongoing stress, inflammation and lifestyle factors which impact the immune response. SOLUTION: Support and enhance the immune system routinely to prevent problems and health conditions from arising, safely and effectively! 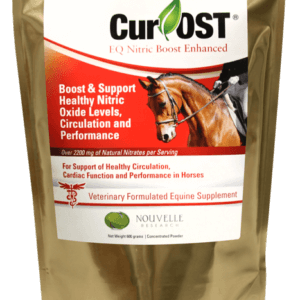 Our Cur-OST EQ Immune & Repair equine supplement provides potent immune support through the use of a patented, micronized blend of mushroom polysaccharides and amino acids to give you results! Immune health is vital to recovery and protection! Ideal to aid in recovery from a variety of health conditions as well as supporting the immune system during times of stress such as during competition, trailering or post vaccination. 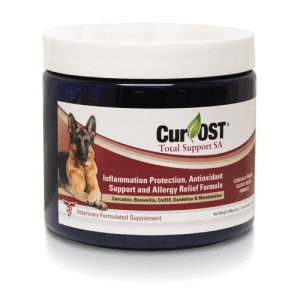 Our Cur-OST EQ Immune & Repair formulas has been found to be beneficial in the assisted management of challenged or compromised immune systems. It has also proven valuable in aiding tissue repair including torn ligaments, torn tendons and muscle injuries. This formula may be used as a stand alone to enhance immune function or combined with one of our inflammatory support formulas for better overall management. For Enhanced Recovery: Combine with either our Cur-OST EQ Green, EQ Plus, Pure EQ or EQ Total Support formulas to further enhance and support health! A Great Addition To Any Regimen To Support Overall Health And Immune Function! Veterinary Formulated, Research Supported And Clinically Utilized To Get Results For Over 7 Years! How does the EQ Immune formula work and benefit my horse? The EQ Immune & Repair formula contains a patented blend of micronized mushroom derived beta-glucans (Immune Assist Micron®) along with added vital amino acids to support and promote a healthy immune response which might be impaired during times of infection, transportation, stress related or even post vaccination. What conditions can benefit from use of the EQ Immune & Repair formula? Many conditions can benefit from a healthier immune response, including recurrent infections, allergies, hoof conditions and eye problems. Is the EQ Immune formula okay to use alone or best in combination? 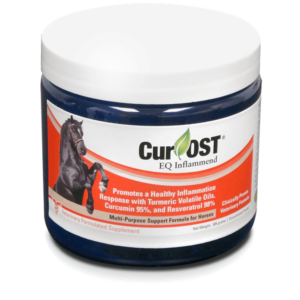 We generally recommend using the EQ Immune with one of our other Cur-OST® formulas which help to support a healthy inflammatory response for best results in most cases. Does the EQ Immune formula contain any banned substances? No, it does not contain any banned substances based on the printed list provided by the USEF or FEI. We recommend to consult with your disciplines organization for the best guidance. Is the EQ Immune safe to use with other supplements and medications? The EQ Immune is safe to use with other health supplements. We do recommend to consult your veterinarian if your horse is taking prescription medications. This product, in combination with Total has saved my allergy ridden mare. It should make any horse owner feel comforted, the amount of issues it helps/treats is insane! The EQ Immune & Repair has been instrumental in restoring my horse’s health. For several years we have tried to manage allergies and other respiratory issues and were unable to do so effectively. Once they snowballed out of control, we had a very serious case of respiratory distress and sought help. Despite following the advice of several veterinarians and administering many medications, we were unable to get the issues under control and managed. Through the advice of Dr. Schell and the use of the EQ Total Support combined with the EQ Immune & Repair, we were able to get the respiratory issues controlled, and in less than 30 days I was back to riding a horse who had previously been given zero chance to recover. This program has been a life changer for my horse and I will never be without the Cur-OST products in my barn!